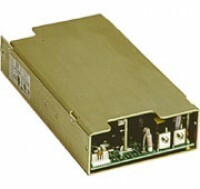 The LPS250 AC-DC Power supplies can be specified with end or top fan covers. With either fan cover, the series gives up to 250W. The power supply can be ordered without a fan for requirements where external fan cooling is provided.